Find motivational speakers, comedians and clean entertainers in North Dakota for your next meeting or event. Each of the keynote speakers listed below have recently performed their highly-engaging presentations in North Dakota. Using his Southern "good ol' boy" persona to first charm his audience, Vic wins them over entirely with his well-crafted humor, improvisational ability, quick wit, and high energy performance. A native of Oxford, Alabama, Vic graduated from Auburn University and headed to Phoenix for a career as a stockbroker. "5 stars - Extremely Satisfied"
"Jerry Carroll related really well to our group. After a long day of meetings, he was just what we needed to have a few laughs and put some smiles on faces." "We had a quiet group that night but Leslie did a nice job of trying to relate to an ag audience. Clean and fun humor." "John Felts was fantastic to work with! He connected with our group on and off stage, keeping everyone in a great mood and always laughing. John was very professional and very much entertaining for the whole 60 minute performance. Its been a week since he performed and some of our leaders are still making comments about how good his performance was. 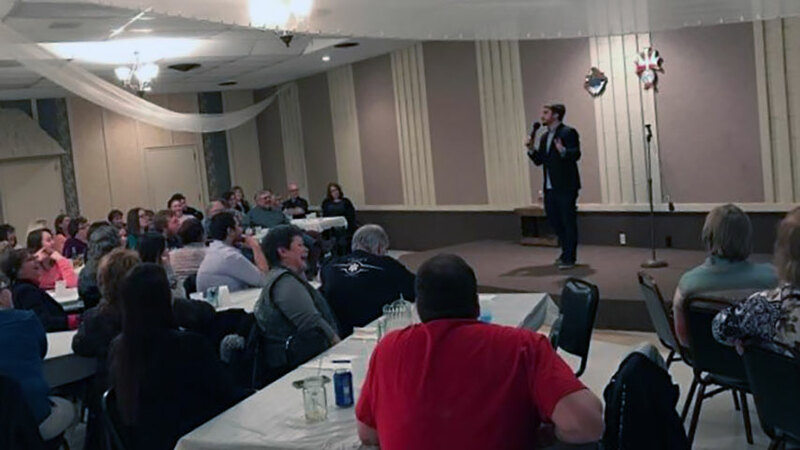 This was our group's first time hiring a comedian and because of our great experience with John Felt we will incorporating more comedians into our last meetings each year. I would recommend John to any company gathering." "Leslie Norris Townsend was everything we hoped she would be for our event! She was a delight to have and did an astounding job! She was funny, yet personable. Leslie was well received by the audience and she related her life story with humor and class! She warmed the hearts and encouraged the lives of those attending with a great testimony, that just so happened to tie into the Pastor's morning sermon! She was a trooper with the weather and a hoot listen to. We'd gladly have her back! Thank you for making it possible for us to have clean comedy on a very cold night in January!" "David Ferrell did an outstanding job at not only meeting expectation but exceeding them. He was fun, funny and authentic. A real joy to work with. I appreciated his heart for the Lord and his desire to be a blessing at our event!" "Jerry Carroll did a great job for us. All the comments we received were very positive! They loved being able to laugh and enjoy the evening. They especially appreciated the rural farm humor as they have all "been there done that" and could identify with exactly what he was talking about. Thanks again for everything!" "Lyndy was great! He was very easy to deal with and would recommend him to anyone!" "Everything went great with Jerry Carroll's appearance. He fit in with the attendees, mixed in and visited before and after our banquet. Everyone really enjoyed him and laughed at his clean humor. Hope to have him back in a couple of years." "Vic was absolutely outstanding! People are still laughing just talking about some of his stories! He was great to work with and I would highly recommend him and I think the other 550+ people that heard him would say the same. He will be hard to top as and entertainer for our next years conference." "We really enjoyed having Jerry come do his show for us. He did a fantastic job of entertaining our elevator employees and board members with his wide array of stories and experiences that pertained to the agricultural lifestyle. He conducted himself and his show with top-notch professionalism. We would recommend Jerry Carroll to other elevators and agribusiness firms." "The feedback I have received on Jerry Carroll's performance has all been positive! Thanks for everything!" "I have heard nothing but positive comments for Jerry Carroll's performance. He was very entertaining and everyone enjoyed themselves." A few of the towns our nationally-touring keynote speakers have performed in include: Bismarck, Bowman, Devils Lake, Fargo, Grand Forks, Jamestown, Max, Minot, Oakes, Wahpeton, Williston, ND and others.